Three of the sixteen moia at the Ahu Tongariki, Rapa Nui. I think it’s kind of amazing how often ancient art looks like modern art. A few years back, on a trip to Rome, I came across the Bocca della Veritá sculpture and thought I’d stumbled upon modern art in the heart of the eternal city. The sculpture is a large stone disc depicting a man’s face, eyes wide and mouth gaping; long hair writhing. An image of terror. A brother, maybe, to Edvard Munch’s The Scream. Turns out, it was made in the first century, and depicts (probably) a pre-Christian god. I guess this should come as no surprise. The ancients, it seems, have inspired much of what we call modern. Picasso, for instance, was inspired by the pre-colonial masks of west Africa, by the simplification and fracturing of forms. By the blowing apart of structure in an effort to find a subject’s essence; by the leaving behind of literal appearances. Last weekend, I was in Rapa Nui (Easter Island). 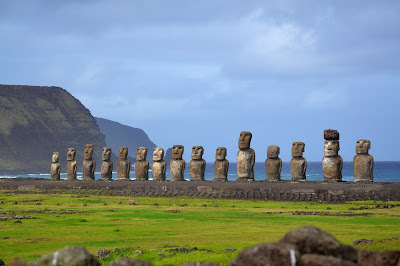 There, I had the incredible opportunity to experience literally dozens of the moai sculptures for which the island and its culture are best known. Standing erect on their ahus (platforms), or lying face down where they were laid to rest. Or in the always-laboured process of birth at the quarry at the Rano Raraku volcano -- the newborn and the still-born -- partially submerged, partially emerging from the earth, itself newly created. 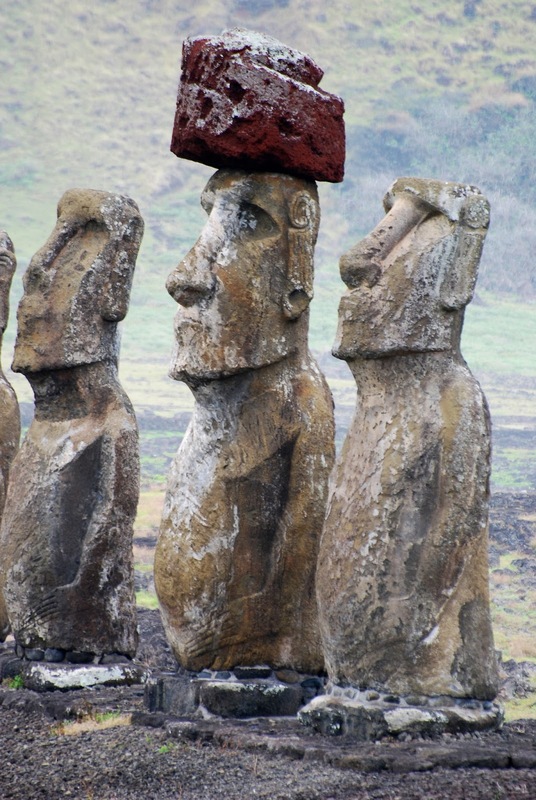 Each moai was carved to represent a king, not merely in his stature or appearance, but in his mana -- his energy or his power. The bones of the king would be contained in the ahu beneath it; the final essence of the once- and still-living ancestor. With coral eyes turned inland and with his back to the sea, the moai king would watch over and protect his people. 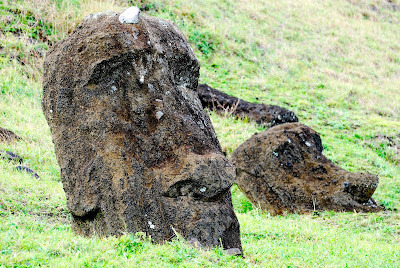 Moai scattered along the slopes of the Rano Raruku volcano. drowning in the liquid earth. Photo by Wendy Stefansson. So here’s my theory. 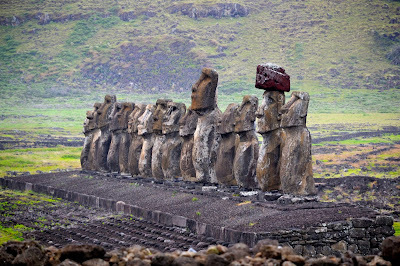 I think if we had never seen the Easter Island heads, and one (or more) was erected in New York city today, we would think it was a modern or contemporary work of art. With its elongated proportions and now-vacant eyes, it calls to mind the paintings of Modigliani. In its blockiness, it calls to mind Brancusi’s Kiss sculptures. In its deliberate distortions -- the head almost as large as the torso, the fingers of the hands extended like knives -- it calls to mind Edward Scissorhands. Or perhaps Wolverine. Detail of one of the moai at Ahu Tongariki. Note the long fingers below the belly. 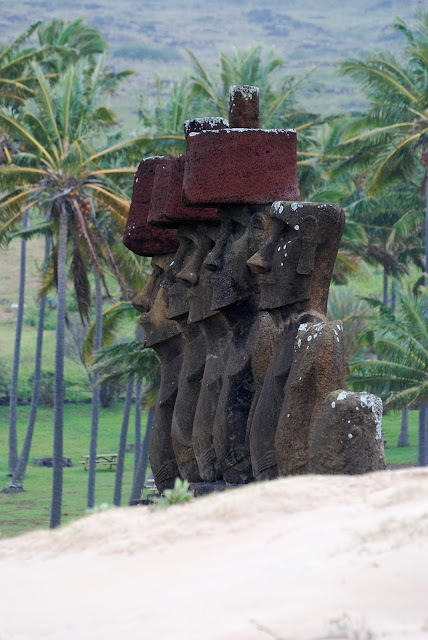 In their monumental quality, their massive scale, their repetition of the same form (ancient artists working in a series), the moai call to mind contemporary approaches to sculpture. And there are other ways in which the traditional culture of the Rapa Nui contains and nourishes the seeds of the modern. The ancient Polynesians invented the tattoo, it seems. They used stretchers to elongate their earlobes, and dyed their hair candy-apple red. 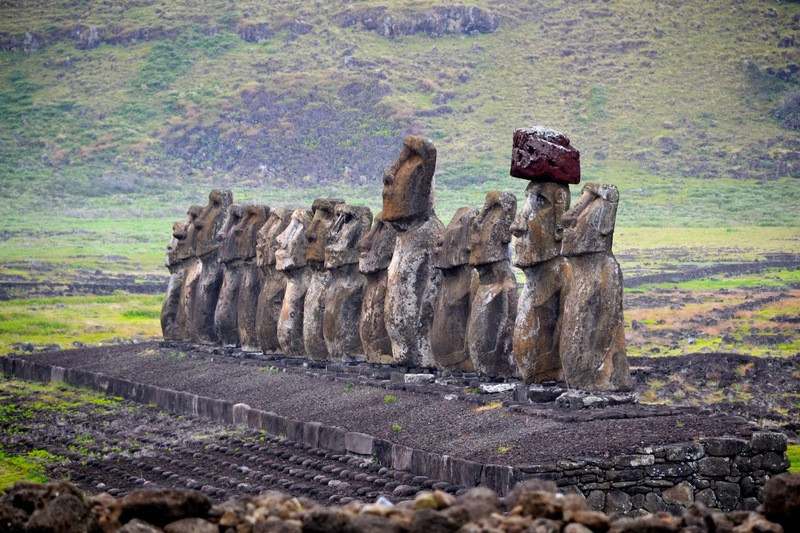 I'm thinking that the moai feel right at home in the 21st century. Rapa Nui dancer in traditional dress, with traditional tattoos. Kari Kari dance performance, 27 July 2013.